Markings on horses usually are distinctive white areas on an otherwise dark base coat color. Most horses have some markings, and they help to identify the horse. Facial markings are usually described by shape and location. There may be more than one distinct facial marking and if so, will be named separately. Occasionally, when a white marking extends over an eye, that eye may be blue instead of brown, though this is not consistently seen in all cases. Faint: A small, yet permanent marking that usually consists of white hairs without any underlying pink skin. As a general rule, the horse's hoof beneath a white marking at the coronary line will also be light-colored ("white"). If a horse has a partial marking or ermine spots at the coronary band, the hoof may be both dark and light, corresponding with the hair coat immediately above. Where the Leopard gene is present, the hoof may be striped even if markings are not visible at the coronary band. 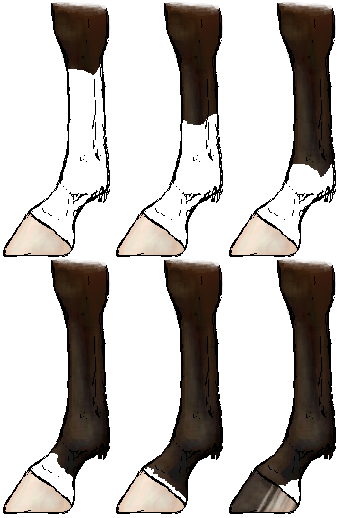 Coronet: white just above the hoof, around coronary band, usually no more than 1 inch (2.5cm) above the hoof.